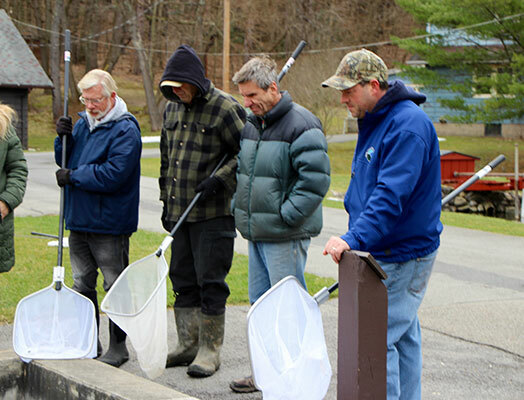 The Fish Hatchery at Powder Mills Park is open all year long. Visitors of all ages are encouraged to visit with staff and learn how Hatchery operations positively affect our local environment. Hatchery staff is on duty Monday through Friday from 7 a.m. to 3:30 p.m. and 9 a.m. to 1 p.m. most weekends. The hatchery phone number is (585) 586-1670. What is the age requirement for a fishing license? 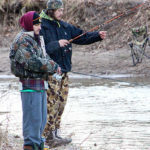 Anyone 16 years of age or older desiring to fish in New York State freshwaters is required to have, and be able to produce on request, a valid New York State fishing license, subject to certain exceptions. Licenses are available for a nominal fee at many sporting good locations and local town halls.Each year, the last full weekend in June is designated as Free Fishing Days in http://www.jump4loves.com/. 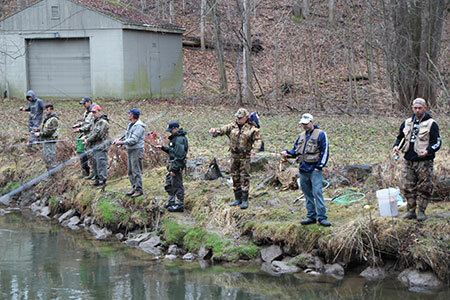 During those two days, anyone can fish New York State waters, and no fishing license is required. This event started in 1991 to allow all people the opportunity to sample the incredible fishing New York State has to offer. Can I fish at the hatchery? No, fishing is not permitted at the hatchery itself; however fish from the hatchery are used to stock the surrounding rivers and streams, which in turn are the sites for multiple fishing derbies held throughout the season. Does the hatchery hold a derby? 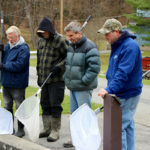 Fun for the entire family and the most seasoned angler, the Riedman Foundation Opening Day Trout Derby to benefit The Fish Hatchery at Powder Mills Park will take place at Powder Horn Lodge from 7am to noon every April 1st. The hatchery is associated with other derbies throughout the fishing season. Visit the News & Events page to learn more. Yes. 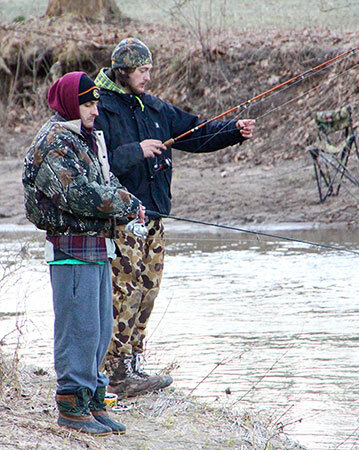 Trout season lasts from April 1st to October 15th. During this timeframe, the park is open everyday from 7am until 11pm. The daily limit is 3 fish, each of which must be 9 inches or larger, and only one of which can be a rainbow trout. What kind of bait works best? Can lures be used instead of live bait? Can I feed the fish at the hatchery? Yes. Dispensers containing food pellets are available at the hatchery for a nominal fee. Please refrain from giving the fish any other kind of food, because it is not an optimum diet for them. Does the hatchery sell fish to the public? What types of fish are raised at the hatchery? Brown trout and rainbow (steelhead) trout. The hatchery also has brook trout on display, which are not released into Irondequoit Creek. Where do the fingerlings come from? The New York State Department of Environmental Conservation (DEC) provides fingerlings (2 to 3 inches long), which the hatchery raises. Does the hatchery have to buy the fingerlings from the DEC? No, because these fish are for the public. How often does the hatchery feed the fish? The fish are fed twice a day. This can be up to 45 to 50 pounds of food! What differences are there in the food fed to younger versus older fish? Fingerling food pellets are smaller, and have more protein and fat, so they can grow fast. The larger the fish get, the more food they need, so they are given bigger food pellets. The adult food pellets are too big for a baby fish’s stomach, so if you were to feed a baby fish these pellets, it could explode! Does a fish’s diet ever change even when it is an adult? Yes. Their metabolism slows down in colder weather, so they need less food. The warmer the water, the more food fish need. What is the process for raising the brown trout? In June, the hatchery receives 10,000 brown trout fingerlings. They are raised in the raceways until the third week of September when they are about 6 inches long. They are then moved to a holding pond, because they’ve outgrown the space in the raceways, and grow to be about 9 inches over the winter.Approximately 1,500 1-year, 250 2-year, and 100 3-year brown trout are released into Irondequoit Creek for the April 1st Opening Day Trout Derby. Stocking continues through the first week of June, with about 1,100 trout released each week. What is the process for raising the rainbow trout? In October, the hatchery receives 7,500 rainbow trout fingerlings and raises them through the winter. In March, the fish smolt and loose their ‘par’ marks to imprint on the water chemistry. They use that as a beacon to return after 2 years. 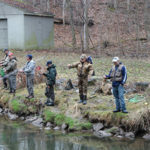 In the first or second week of April, when they are about 6 inches long, the rainbow trout are released into Irondequoit Creek to go to Lake Ontario to mature. A rain event is helpful, as the high water helps wash them into Irondequoit Bay. They eventually return to spawn, by laying their eggs in a gravelly spot in a depression. What does a brown trout look like? Brown trout have light brown or yellow cast with black spots and usually some orange or red spots. The spots often have whitish to bluish halos. The tail generally lack spots, but may have a few. Brown trout are long, narrow and moderately compressed. The color varies from an olive-green to a dark-brown back, silver-yellowish sides and yellow-whitish belly. The dorsal fin in front of the tail has a reddish hue. There are numerous red and dark brown spots scattered on the head, body and gill cover. The tail is slightly forked in young fish and square in older trout. Depending on the environment, their average weight ranges between 2.5 and 10 pounds, with an average length between 14 and 24 inches. What does a brown trout eat? Brown trout are carnivorous, bottom feeders and prefer to eat at dusk or night. The young feed on aquatic insects. Adult brown trout eat food items such as worms, crustaceans, crayfish, mollusks, and salamanders. What do the rainbow trout look like? Rainbow trout are gorgeous fish with coloring and patterns that vary widely depending on habitat, age, and spawning condition. They are torpedo-shaped and generally blue-green or yellow-green in color with a pink streak along their sides, white underbelly, and small black spots on their back and fins. They average about 20 to 30 inches long and around 8 pounds, but can grow as long as 4 feet and weigh up to 53 pounds. What do the rainbow trout eat? Rainbow trout survive on insects, crustaceans, and small fish. Where does all the water come from in the raceways? Water is gravity-fed from the chiller pond to the raceways. The chiller pond is a holding area for well water. Well water has no oxygen and therefore needs to be aerated before it can be used in the raceways. How often are the raceways cleaned? They are cleaned every two weeks. Do the fish ever get diseases? No, because the water is clean. Why is there netting over the raceways containing younger fish? Predator birds such as the Blue Heron and King Fisher. A Blue Heron can kill 500 fish in one year! Copyright © 2019. All right are reserved.